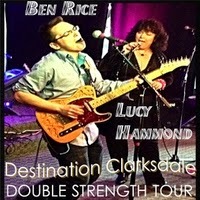 I just received the newest release, Destination Clarksdale, by Ben Rice & Lucy Hammond and they make a fine acoustic blues duo. Opening with Ida Mae a cool shuffle track, Rice lays down a fine guitar base and blends nicely vocally with Hammond. Very cool. Next up is Oh Lord, a quiet delta style track performed with solitude and rich feeling. Rice has his resonator ringing and again the vocal blendings between Rice and Hammond are quite fine. On Gary Davis styled Wants Me Back Again, Rice really shows that he is a fine vocalist and Hammond knows how to push him to even higher heights. With only resonator finger picking, this is my favorite track on the release. A more contemporary track with a modern beat, Turn My Back On You would seem the certain radio track with clever guitar work and a catchy melody. Wrapping the release is Muddy Water featuring Hammond in the lead role. Her rich vocal talent is nicely demonstrated here with only a very light rhythmic acoustic guitar accompaniment. This is a solid release by Rice and Hammond. It's easy to see why their performances have gained them IBC finalist status.